Our taxi had stopped a block from Rio’s famous Copacabana Beach, on a bustling city street lined with shops and juice bars. Before us, stood a high-rise apartment, a rather ugly, but solid, concrete structure standing shoulder to shoulder with other near identical buildings, each guarded by sour-faced security guards. Unsightly metal bars protruded out onto the footpath before each entrance, forming little enclaves, not unlike mini jail cells. Crossing through the jail-like entrance, we entered through the dimly lit front foyer and were escorted to a bank of lifts, which took us eight floors up to our apartment. Light and airy, it had large windows that opened to a spectacular view of the tropical hill-top jungle rising up behind urban Copacabana. This was to be our home for the month. 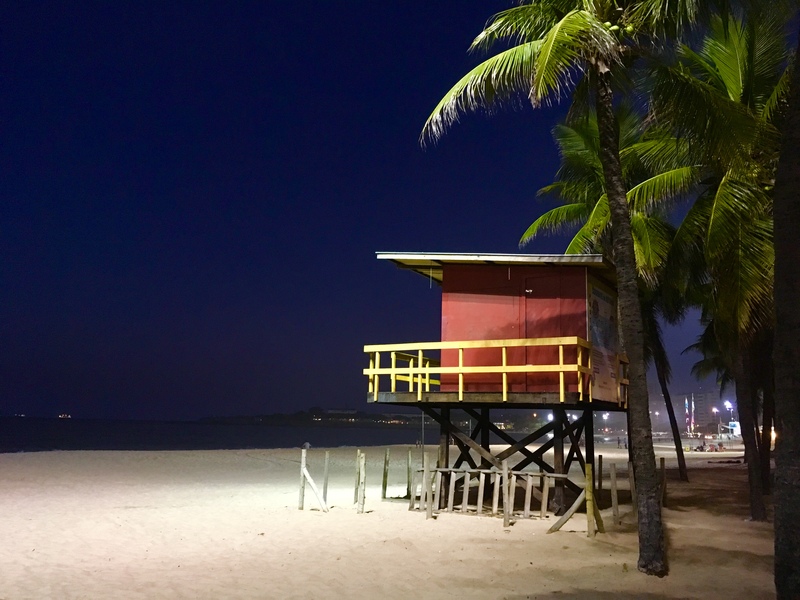 Zona Sul or the South Zone of Rio de Janeiro is dotted with some of its most famous beaches. 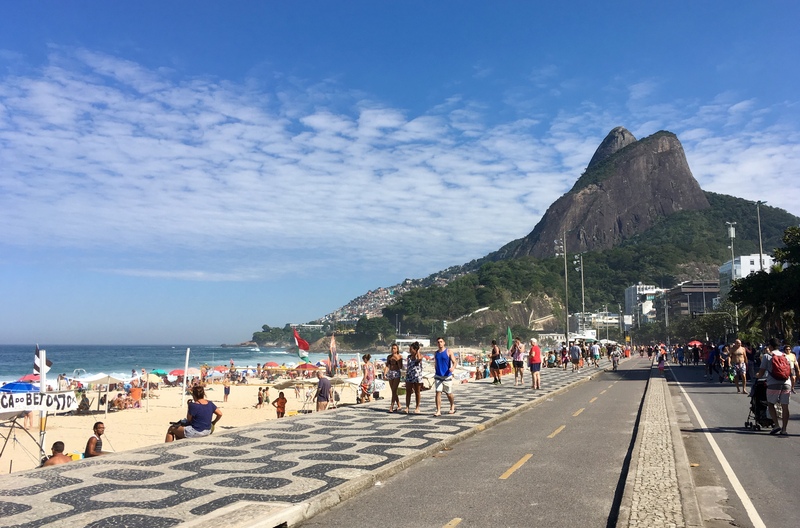 The iconic Copacabana stretches out over four kilometers, before a backdrop of glitzy high-end apartments and hotels and verdant mountains beyond. The palm tree lined promenade, made of black and white mosaics laid out in psychedelic waves, would soon come to be a symbol of my time in Rio. It’s on this stretch of footpath on Avenida Atlantica that I learnt to embrace Rio’s super chill beach culture. Countless kiosks (beach bars as residents call them) lined the promenade, spilling out onto the warm sand beyond. 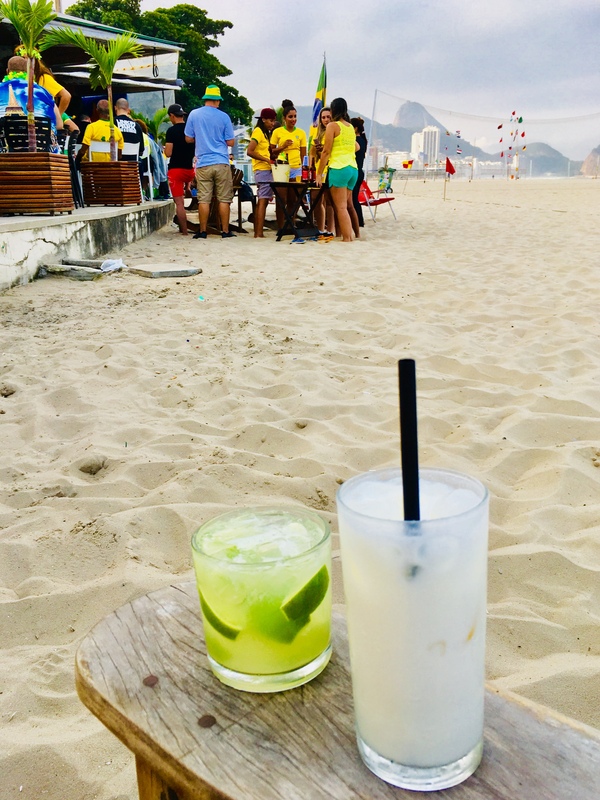 A retinue of waiters dashed among patrons spilled around the beach, crispy plates of calamari and caiprinha (Brazil’s national drink) in hand. 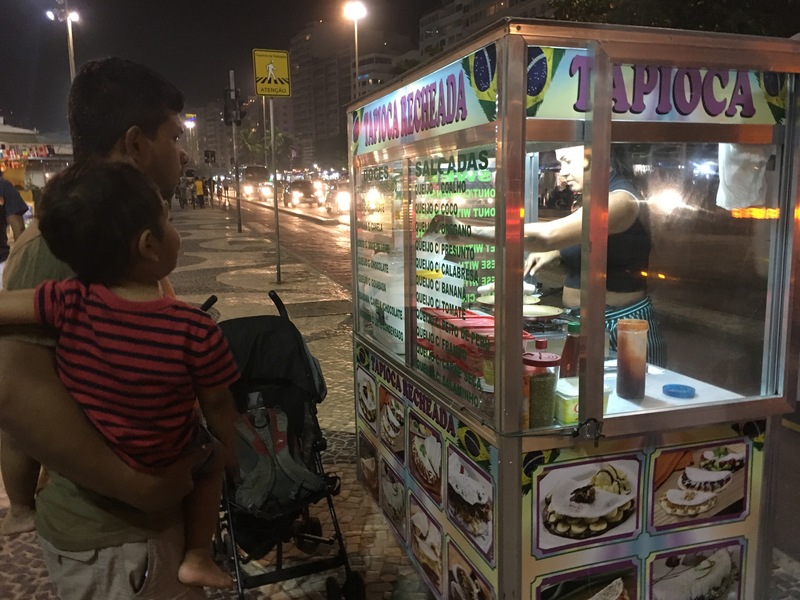 Tiny carts plied the promenade, selling street side favourites like açaí ice cream and tapioca pancakes during the day, and feisty caiprinhas once the sun had set. 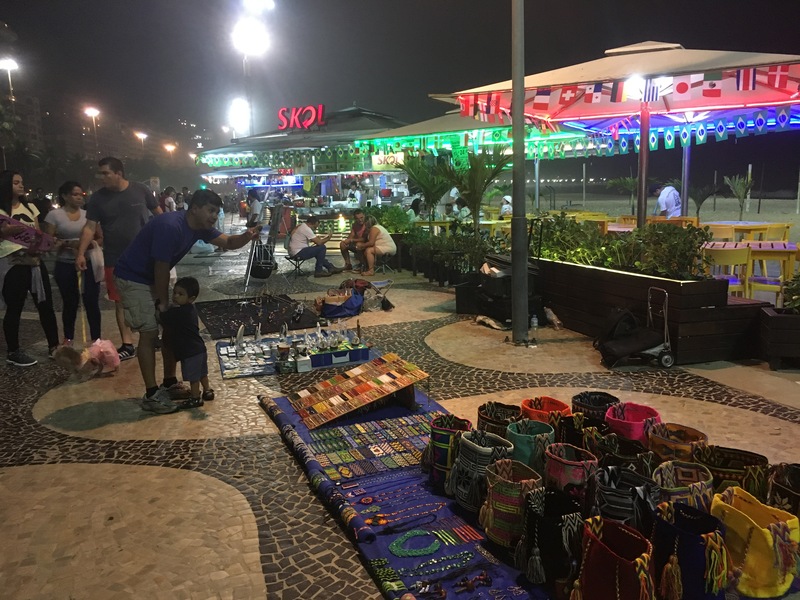 More entrepreneurial cariocas (residents of Rio de Janeiro) had set up shop along the esplanade, displaying their wares – from artwork and souvenirs to sun hats and customised city tours. Their vociferous calls to attract attention to their sales would often turn to alarm at the sight of the police, the presence of whom would prompt them to quickly pack up and disappear, until the police cavalcade had left. 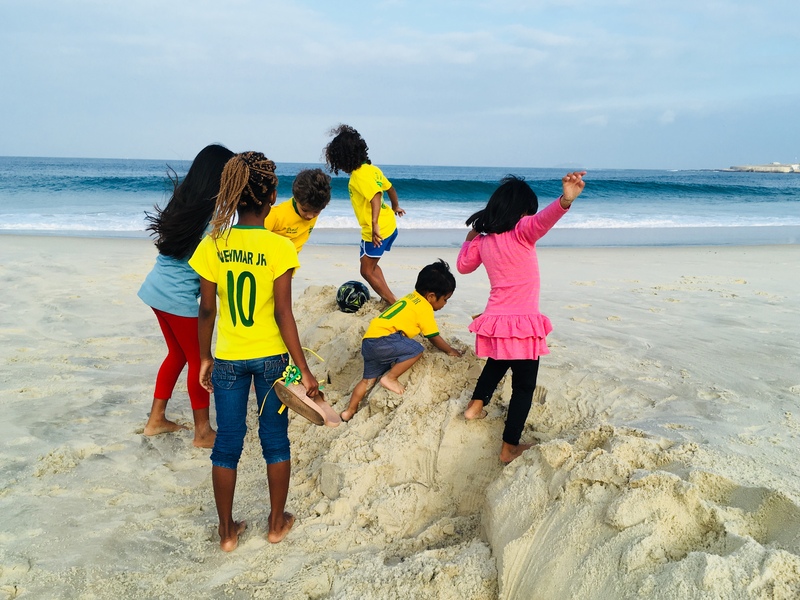 On the beach, tanned cariocas smashed volleyballs over the countless nets strung out near Rua Santa Clara, while favela kids engaged in stupendous tiki-taka between goalposts in the sand. Whether it was night or day mattered little, as the scene was always festive. Those with a creative streak built sensational sand sculptures in the hopes of enticing tourists to take photos in lieu of donations; others whittled shells and driftwood into beautifully crafted jewellery. All this, to the ever-present beat of the samba. Somehow, or perhaps unsurprisingly, our little family was completely seduced by this beach culture. Mornings would see us saunter over to one of the juice bars for a quick bite of coxinha (Brazilian chicken croquette) and avocado smoothie. 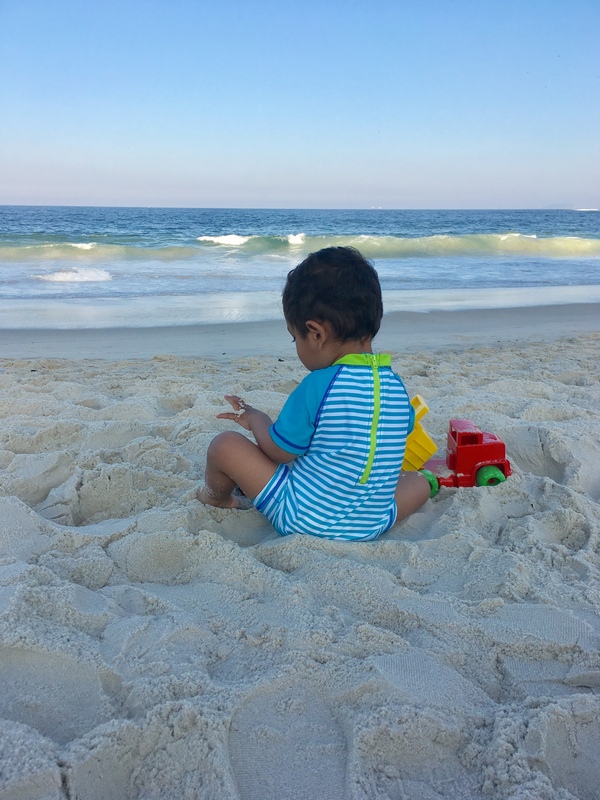 Then, with beach towels slung around our necks, balancing the toddler and his armament of digging paraphernalia, we’d hit the beach, where we would end up spending the better part of the day. Quite astonishing given we never quite saw the point in lounging around on the sand beyond a quick swim in the ocean. 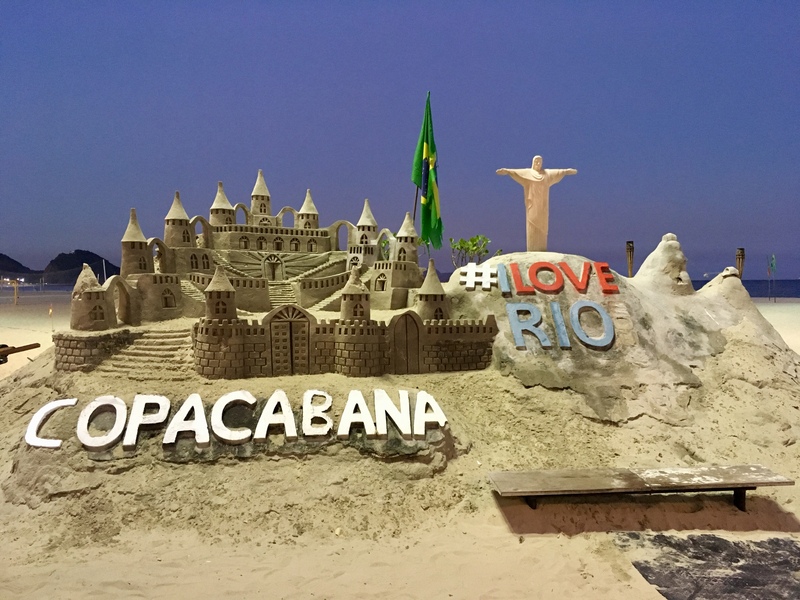 Copacabana, however, made it easy. It is possible to literally sit on a sun lounger on the beach and not leave all day. Need some shade? Beckon over one of the beachside stall attendants and they’ll swiftly set you up with a beach umbrella and chairs for as little as 5 USD – the set price for the day. Thirsty? Flag down any of the vendors selling fresh coconuts or icy, cold caprinhas. Forgot your swimsuit? Not to fret, hawkers will magically appear with impressive collections of bikinis, hats and cangas. 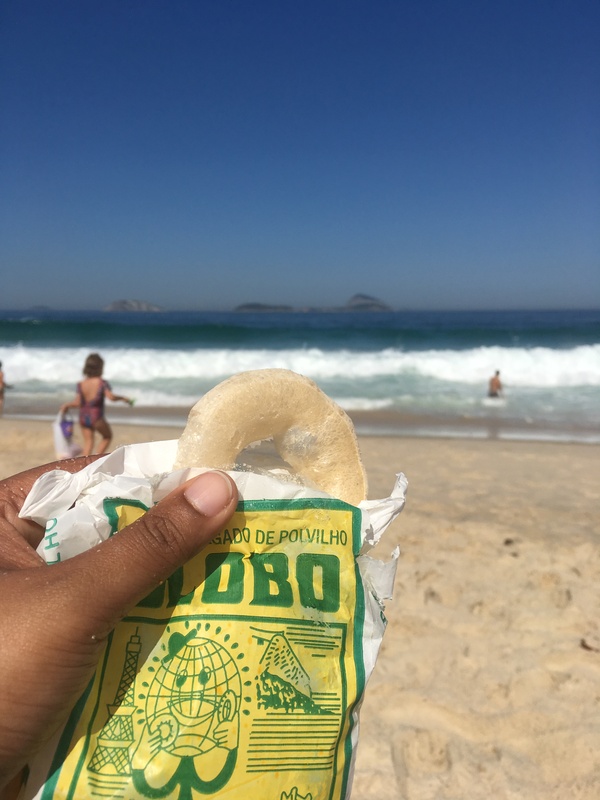 To appease our hunger pangs, we’d wave down one of the many vendors that meander up and down the beach with their tiny metal grills for a queijo coalho – a popular beach snack. The hawkers would rummage in their polystyrene boxes and extricate a slab of cheese, throw it on the tiny, coal fired BBQ and slather it in honey or dried oregano, before handing it over for us to devour unceremoniously, as sticky honey dribbled down our hand, mingling with sand and salty sea water. Messy perhaps, but there was something blissful in its simplicity. When it got too hot, we’d jump into the ocean to cool off. My son however, preferred digging a hole for himself in the cool sand and chilling out. Families would amble past, setting up camp nearby. The kids would run amok on the sand and my son, enchanted by their play, would scamper out of his little hole and join forces with them to dig even bigger holes. The cariocas were only too happy to let him join them, often feeding him from their family’s pack of Biscoito Globo – light, puffy ring-shaped biscuits – the quintessential beachside snack. Sometimes we were joined by favela kids, who regardless of their ages, would delight in showing him how to tumble over the sand. Between watching him make new friends and staring unabashedly at toned, bare-chested cariocas play futevôlei (soccer volleyball), we were never short for entertainment. Even on days we’d go on city tours, we’d always somehow end up at the beach. Even if it was for a brief post dinner stroll. We’d been warned by all and sundry to stay away from the beaches at night, warnings that I’m sure had some basis to it. But on the brightly lit promenade, with families lounging around and thumping music adding to the festive atmosphere, we found little to be intimidated of. When we tired of Copacabana, we’d explore the neighbouring beaches of Leme and Ipanema. Frank Sinatra sang true – the girls walking along the beaches were tall and young and lovely indeed. Weekends found us on Leblon, a trendy, upscale suburb with play equipment on the beach itself. The length of road by Leblon beach would be closed to traffic as families strolled down the middle of the wide boulevard, picknicking under palm trees. 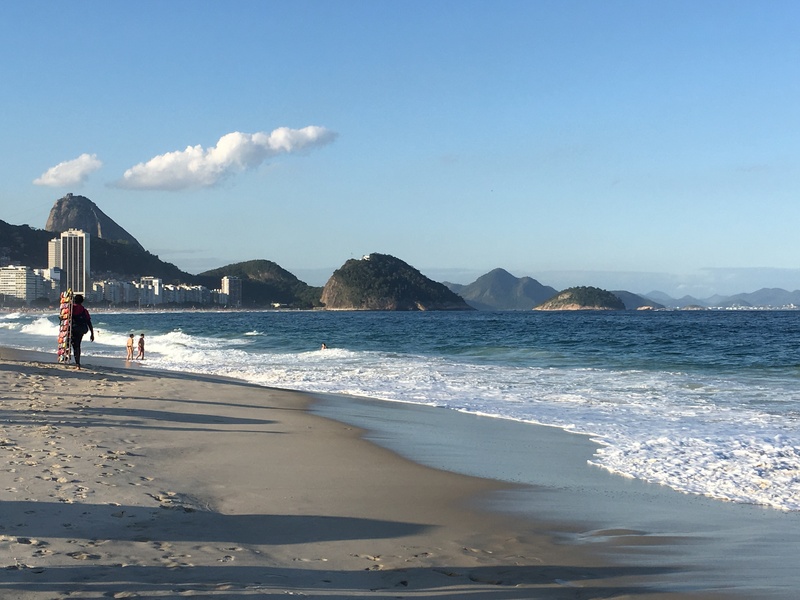 Both beaches at Ipanema and Leblon offer spectacular views of the beguilingly shaped mountains that typify Rio’s coastline. Next stop: Sights and sounds of Rio de Janeiro!